Infinite Interactive, the creators of Puzzle Quest, continue to combine adventure and gem-matching with Puzzle Chronicles, part roleplaying game, part Puzzle Fighter. That's exactly how the Konami representative described the game to me at E3 last week. Puzzle Quest meets Puzzle Fighter. The game tells the story of the lone survivor of a barbarian tribe, rescued by a mysterious benefactor and set on a path of revenge on against the Empire for killing your people. Not the most original storyline, sure, but it gets the job done. Besides, games like these are all about the puzzles. While there are several mini-game puzzles in the game that let you tame pets or unlock randomized dungeons, the main puzzle battles are a sort of a sideways take on Capcom's Puzzle Fighter, with skills thrown in. 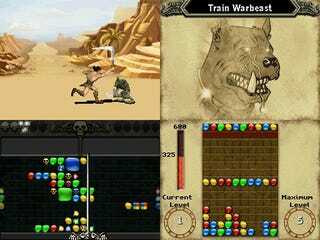 Players match gems and skulls of similar colors, playing tug of war with a line in the middle of the screen. As you play you accrue colored mana pools which can be used to execute special attacks, which are earned by leveling up and applying points to a skill tree. I played a quick round with the Nintendo DS version of the game, and while the game mechanics are intriguing, the graphics leave much to be desired. I'm looking forward to seeing a more polished of the game for the PSP, Xbox Live Arcade, PC, and PlayStation Network, as the DS version is just a bit too ugly for my tastes. My love affair with the puzzle RPG isn't over; I just expect a bit more polish than this.